C, D, E, F, G, A, B natural is the main guitar scale. This can be extended with sharps and flats, and multiplied by the number of octaves. I’d like to mention that the interval between frets is one semitone, that is, when you hear “half tone up” or “half tone down” you should move one fret either towards the guitar body, or towards the headstock. Therefore, 2 frets is equal to one tone. For reference, in terms of frequency, the sound between neighboring frets differs by 21/12s. The sharp sign (#) is the symbol specifying raising any note of the scale by a semitone. The flat sign (b) is the symbol specifying lowering any note of the scale by a semitone. 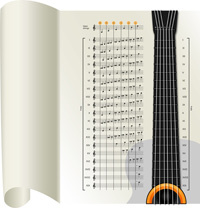 Just in case you need it, here is a full guitar scale showing the musical notation for every note. Click the figure to enlarge. Let me explain. What’s the point of musical notation, what is its practical meaning and benefit for people who are not advanced at reading music? The single note scale can be associated with the chord scale. For example, if you know how to play the C chord; the next one up is C#. You just need to move all the sounds that make up the chord up by a semitone (towards the guitar body) to play the C# chord. Please note that C# and Db are one and the same chord; therefore D# and Eb are also one and the same chord. E and B natural don’t have sharps, while F and C don’t have flats. The full chromatic scale is: C, C# (Db), D, D# (Eb), E, F, F# (Gb), G, G# (Ab), A, A# (Bb), B.
Bb and B natural notation details are explained in Some notes on chords section.